It's Oscar time and I want to showcase some not so typical Oscar worthy gowns. First up is this multicolor graphic print gown CIRCA 2010 by London based designer Mary Katrantzou. This gown is for risk-takers. I can see Maggie Gyllenhaal pulling off this gown, last year she definitely stepped off a ledge in Dries Van Noten and landed safely. 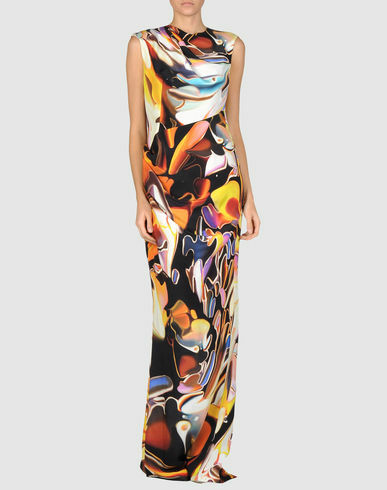 2nd on my list is this Emanuel Ungaro boat neck graphic print gown with drop sleeves CIRCA 2009. The person wearing this gown needs to bring a lil sass on the red carpet, I can see this on Vanessa Williams, Jennifer Lopez or Kate Hudson (the baby bump would fit too). My final choice is from the Lanvin Resort collection CIRCA 2010. This floral print gown glides between pretty and ugly. Lets say ugly cute but I love it. I can't think of anyone who could carry of this floral drama. Who do you think could grace the red carpet in this gown?